Before using our plastic hooks, ensure that surface is clean, dry and free from grease or dust. Marking exactly where it will be placed, as repositioning will cause the adhesive to weaken. Peel off the release paper without touching the adhesive. Place in the required position and press firmly to ensure good contact. Leave in place for 12 hours before hanging item. With rich experience on manufacturing hooks and hangers, we are regarded as the leading manufacturer in the industry. 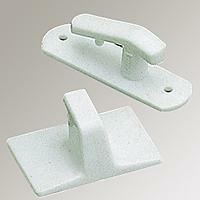 Most of our plastic hooks are sold in European market. For delivery, we can pack products in bulk, blister packaging, compartment box and poly bag. If you are looking for quality hangers, please contact us today!